If the old websites are still stored in your browser, be sure to hit Refresh so you can catch up on all the new product and educational information the new websites provide. 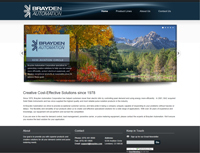 Brayden Automation is sponsering and attending the Creation Care Conference on Climate Change & Faith this April 14-15 in Wheat Ridge, CO. Stop by our booth and visit with BAC President Bill Brayden. For all faith traditions (or none!) Hosted by Colorado Interfaith Power and Light. Keynote Speaker is Rev. Rebekah Simon-Peter, Director of BridgeWorks in Casper, Wyoming, and author of Green Church books, on “Creation Stewardship in a Changing World,” PLUS speakers on Colorado climate changes, de-carbonizing the grid and grassroots organizing. Choose 4 workshops from 16 sustainability-related topics. Visit with 15-20 exhibitors, including green vendors and nonprofi ts. Cost $40 (with early bird discount before 3/30), additional discounts for senior/student/low income/volunteers and 3 or more from same congregation. CoIPL’s mission is to educate and energize Colorado’s diverse faith communities to care for God’s creation.